What is Spousal Privilege in Maryland? I don’t want to testify against my spouse in his/her criminal case? That is a common statement made by many spouses in Maryland. Most common in assault or domestic violence cases. But we hear that in various other criminal prosecutions in Maryland. Can you be forced to testify against your spouse? The answer is generally: No. This doesn’t mean the case goes away or the State can’t overcome their burden before a Judge or jury. This only means the State does not have the spouse’s testimony to present as evidence. But they could offer other statements as evidence the spouse made a 911 phone call or provided a written statement. (iii) The spouse refused to testify at the previous trial on the basis of the provisions of this section. There are two exceptions to using or invoking your marital privilege in Maryland. 1) You cannot invoke your marital privilege if the Defendant is facing charges for abuse of a minor. 2) You cannot invoke your marital privilege for a second or subsequent assault if the spouse has previously invoked their marital privilege for an assault or assault and batter of the spouse. I Don’t Want to Testify Against My Spouse? How does it work in Court? The person charged with the crime will have to plead “not guilty” and elect a trial before the Judge or jury. Any person that is considering spousal privilege in Maryland should consult a criminal defense attorney to understand the ramifications and procedures. As discussed earlier, even if the spouse invokes their marital privilege, the State could still try and prove the case by other evidence or statements. What happens if I invoke my marital privilege in Maryland? If a spouse invokes their marital privilege, then the State cannot force them to testify. If the spouse/witness is the only evidence the State has, then the verdict in the case will more likely than not be “not guilty” after the State’s case, this is typical when the defense attorney makes a Motion for Judgment of Acquittal. However, if the State has other evidence, invocation of the marital privilege may not end the case and the State may try to proceed without the testimony of the spouse. This can occur if the State has additional witnesses or evidence that is admissible during the trial. Can I invoke my marital privilege more than once in Maryland? In most cases, yes, but for assault and assault and batter cases, you cannot invoke your spousal privilege more than once in Maryland. 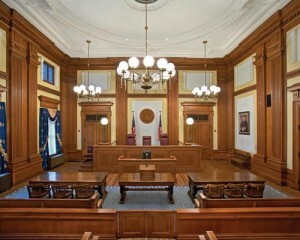 The Court keeps a record of spouses and defendants that have had cases where the spouse invoked their marital privilege. This information is not expunged and will be kept in the Court system accessible by the Court, the State’s Attorneys and defense attorneys for future criminal cases involving the same defendant. If you or your spouse has been charged with a crime in Maryland, contact attorney Randolph Rice with the Law Offices of G. Randolph Rice, Jr., LLC. Randolph Rice is a former Assistant State’s Attorney and has been handling criminal matters in Maryland since 2006. He is recognized by Super Lawyers and his colleagues as a Maryland Rising Star for multiple years. He has been ranked by Avvo, a top online attorney Rating Service, as a 10 out of 10 Superb. In addition he is rated by Lead Counsel. He is a member of the American Bar Association, Maryland State Bar Association, Baltimore County Bar Association and the Maryland Criminal Defense Attorneys’ Association. You can contact Mr. Rice at (410) 694-7291 or email him directly for immediate help.